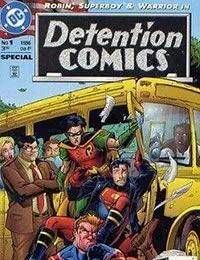 This comic follows three stories about Robin, Superboy and Warrior.Robin follows a fellow suspicious classmate. Superboy is lectured for slacking off. Warrior returns to his old school to substitute in an unruly atmosphere.It is a slightly comical look at reasons to stay in school, help others, and stand up for what you believe in.